Last week, Buffalo Wild Wings seemed to bring one of its football-focused TV commercials directly to the field in what appeared to be a clever act of experiential marketing. A long-running TV commercial for the Minneapolis-based restaurant chain was seemingly replicated during the third quarter of last Sunday’s game between the Miami Dolphins and the Seattle Seahawks. Bloomberg Businessweek reported on how this strikingly similarity had football fans asking whether this was coincidence or conspiracy. 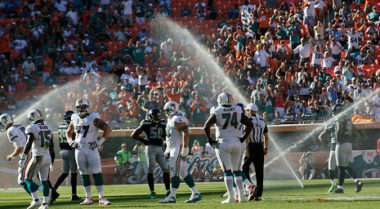 The incident featured a sudden downpour that interrupted the game by soaking only the players and people on the field. Apparently, the cause was the stadium’s sprinkler system that had mysteriously been turned on. Spectators stared in disbelief, as the event bore a remarkable resemblance to a TV commercial for Buffalo Wild Wings where fans hack into the stadium’s sprinkler system to keep the game going longer. Twitter immediately lit up with people expressing shock over the freak football incident. Soon after, the company appeared to take credit for the stunt on its official Twitter feed by tweeting that they hit the sprinkler button a little too early. “We always talk about how we bring the stadium experience into Buffalo Wild Wings, but yesterday, it looked like we brought Buffalo Wild Wings to the stadium,” explained Kathy Bening, executive vice president for global brand and business development at the company. She added that fans were quick to call to attention to the connection. Whether accident or act of savvy marketing, the occurrence clearly captured the attention of spectators and got football fans buzzing about Buffalo Wild Wings. MDG Advertising, a full-service advertising and digital marketing agency with offices in Boca Raton, FL and New York, NY, specializes in developing targeted Internet marketing solutions, exceptional creative executions, and solid branding and media buying strategies that give clients a competitive advantage. Our core capabilities include branding, logo design, advertising campaigns, digital marketing, print advertising, direct mail marketing, media planning and buying, radio and TV advertising, video, Web design and development, email marketing, social media marketing, and SEO.